The Greek phrase Diadochus uses which was translated mindfulness of God was mneme theou, literally the memory of God, or the remembrance of God – a living memory. This of course is the antidote to the ego as concretisation of God-forgetfulness, other-forgetfulness and creation-forgetfulness. The practice of the memory of God helps us to remember God, remember others, remember creation, and remember our true self – made in the image and likeness of God. It releases us from the prison of the ego into a new freedom. A very rare bird from Africa, a Hoopoe was spotted by an attentive home owner in Poole recently, blown a thousand miles off course from its planned destination on the shores of the Mediterranean. It was amazing to see his photo, the last one I had seen used to land in our garden in Nairobi. Also making the news each week is mindfulness, which some might categorize as an Eastern import blown thousands of miles off course, and not native to the West or Christianity. However, if you look at the desert ascetics within early Christian spirituality you find elements of mindful awareness practice emerging, because mindfulness as an ability to be attentive and aware is a universal human capacity. What the ascetic is guarding against is the afflictive thoughts. These early Christians developed a sophisticated psychology which mirrors that of modern cognitive psychologists. Now, obviously before the thought can be disclosed to a spiritual father or mother, you need to become aware of it. There was no experiential avoidance, each thought was rigourously named, each element of temptation recognized and labelled. As with any act of awareness of sustained attention it requires the ability to be aware in the present moment. There is no thought suppression, the first thoughts are disclosed to a spiritual elder immediately they are noticed. It is intentional and investigative. This mindfulness has an ethical and community dimension. These terms – sustained attention, switching attention, self-regulation of attention, being in the present moment, elaborative and secondary processes, rumination, experiential avoidance, acceptance, intentional investigative awareness – are all terms and insights from the world of cognitive psychology. They are also the first part of a proposed operational definition of mindfulness from a team of researchers. Mindfulness as a mode of awareness that is a universal human capacity needs to be distinguished from the meditative, or mindful awareness practices, that evoke it. Those of you familiar with mindfulness definitions will recognise the echoes of present-moment awareness, and paying attention to the streams of thoughts, feelings, ruminations, etc. within our minds. The second component of their proposed operational definition involves adopting ‘a particular orientation towards one’s experiences in the present moment,’ which we will come back to. One of the main meditative, or mindful awareness, practices is attending to your breath. This is a reality-focused, neutral practice that anyone can do. It is not religious or spiritual. Attending to your breath develops your skills of sustained attention so that ‘thoughts, feelings, and sensations can be detected as they arise in the stream of consciousness.’ In mindful awareness practice the practitioner needs to ‘bring attention back to the breath once a thought, feeling or sensation has been acknowledged.’ This develops skills in switching attention which in turn makes our ability to be attentive more flexible. There is another benefit to this self-regulation of attention. Bishop et al. (2004) conclude that the notion of mindfulness as a metacognitive process is implied in their operational definition because it involves monitoring and control. Acceptance is often misunderstood as passivity, but it is about ‘allowing’ current thoughts, feelings and sensations (Hayes, Strosahl, & Wilson)’. Acceptance can helpfully be seen as the opposite of thought-suppression or experiential avoidance; it is facing the reality of the thoughts, feelings and sensations we have. is instructed to make an effort to notice each object in the stream of consciousness (e.g., a feeling), to discriminate between different elements of experience (e.g., an emotional ‘feeling’ sensation from a physical ‘touch’ sensation) and observe how one experience gives rise to another (e.g., a feeling evoking a judgmental thought and then the judgemental thought heightening the unpleasantness of the feeling). This is worth quoting in full because it points out how much of this is acute observation of what actually goes on in our minds, usually out of our awareness and automatically. This monitoring of the stream of consciousness is likely to correlate to increased emotional awareness and psychological mindedness. Within this monitoring is the insight that we are not our thoughts and feelings, that these are passing events and not a direct readout of reality or necessarily inherent aspects of the self. we see mindfulness as a process of regulating attention in order to bring a quality of non-elaborative awareness to current experience and a quality of relating to one’s experience within an orientation of curiosity, experiential openness, and acceptance. We further see mindfulness as a process of gaining insight into the nature of one’s mind and the adoption of a de-centred perspective (Safran & Segal, 1990) on thoughts and feelings so that they can be experienced in terms of their subjectivity (versus their necessary validity) and transient nature (versus their permanence). They also summarise mindfulness as ‘a mode of awareness that is evoked when attention is regulated in the manner described.’ They argue that this mode, or psychological process, is only evoked and maintained whilst attention is being regulated in the manner they describe, with the open orientation to experience. There are fascinating parallels here between the proposed operational definition for mindfulness by cognitive psychologists outlined above, and the spirituality of the early Christian ascetics, which deserve to be explored further. Haussher, Irenee, (1990). Spiritual Direction in the Early Christian East (Cistercian Publications, p.225). Teasdale, J.D., Segal, Z.V., Williams J.M.G., & Mark, G. (1995). How does cognitive therapy prevent depressive relapse and why should attentional control (mindfulness) training help? Behavior Research and Therapy, 33, 25-39, quoted in Bishop, S.R. et al. ‘Mindfulness: A Proposed Operational Definition’ (2004). Clinical Psychology: Science and Practice, 11 (232). Haussher, Irenee, (1990). Spiritual Direction in the Early Christian East (Cistercian Publications, p.157). Bishop, S.R. et al. ‘Mindfulness: A Proposed Operational Definition’ (2004). Clinical Psychology: Science and Practice, 11 (230-241). Bishop, S.R. et al. ‘Mindfulness: A Proposed Operational Definition’ (2004). Clinical Psychology: Science and Practice, 11 p.233. Roemer, L., & Orsillo, S.M. (2002), quoted in Bishop, S.R. et al. ‘Mindfulness: A Proposed Operational Definition’ (2004). Clinical Psychology: Science and Practice, 11 (233). Quoted in Bishop, S.R. et al. ‘Mindfulness: A Proposed Operational Definition’ (2004). Clinical Psychology: Science and Practice, 11 (233). Hayes, S.C., Wilson, K.G., Gifford, E.V., Follette, V.M. & Strosahl, K. (1996).’ Experiential avoidance and behavioural disorders: A functional dimensional approach to diagnosis and treatment’. Journal of Consulting and Clinical Psychology, 64(6), 1152-1168. Quoted in Bishop, S.R. et al. ‘Mindfulness: A Proposed Operational Definition’ (2004). Clinical Psychology: Science and Practice, 11 (237). Bishop, S.R. et al. ‘Mindfulness: A Proposed Operational Definition’ (2004). Clinical Psychology: Science and Practice, 11 (235). Barsanuphius quoted in Haussher, Irenee, (1990). Spiritual Direction in the Early Christian East (Cistercian Publications, pp.227-228). Just before my first sabbatical seven years I was stressed, anxious and near to burn-out. I hadn’t fully realised this, but just a few weeks before I was due to start the sabbatical I was lying in bed, and suddenly I felt this big ball of anxiety come out of my stomach, through my body, and out of my mouth. It was like a showing from God I was suddenly aware of the anxiety I had been holding down. 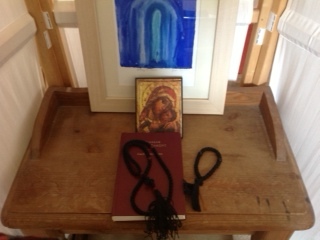 Then in a bookshop Simon Barrington Ward’s book The Jesus Prayer lept off the shelf at me. The book and the practice of the Jesus Prayer, helped me enormously, as did some conversations with Bishop Simon (formerly Bishop of Coventry), when doing some interviews for the Baptist Times. Mark’s Gospel also became a book of healing for me. When I began to use the Jesus Prayer it acted very like some of the Celtic prayers, as a circle of protection. For a while it kept at bay the feelings of anxiety or the afflictive thoughts that were troubling me. But if you read the writings of the Desert Fathers and Mothers you find out there are some thoughts (and in the end all thoughts) that you can’t keep at bay. They called these the Eight Afflictive Thoughts, which became trivialised as the Seven Deadly Sins. These were pride, anger, lust, gluttony, acedia, sadness, greed and vanity. At some point, as these thoughts are kept at bay for a while, we realise that we are not our thoughts, that we are bigger than our thoughts. If we are aware that we can take them captive, that relativises them – they are smaller and less powerful than we think. They are not the powers and authorities that they can become in our minds. By characterising these afflictive thoughts as demons, the Desert Fathers and Mothers achieved this observing distance from their thoughts; they relativised them in that way. Mark tells us that one of the reasons we fail to see and hear and understand the mystery of the kingdom, the key to real living, is that we have hard hearts. Jesus asks the disciples, ‘Are your hearts hardened?’ (Mark 8:17) when they fail to understand the feeding of the 5,000. Contemplative practices like Lectio Divina and the Jesus Prayer enable us to open and soften our hearts – that is why they are so applicable to helping us become the disciples Mark wants us to be. At some point we have to move from the Jesus Prayer acting like a protective circle, to something more like a fragile coracle in which we enter the sea of our thoughts and feelings and the wider world and God. We move out of the harbour into the open sea. The harbour is the place of experiential avoidance, the sea is where we engage with what we have been hiding from, what we have run from, what we have pushed down out of our awareness. We move from a place of narrow concentration to a place of open awareness. From a psychological perspective, the disciples in Mark are guilty of experiential avoidance. When Jesus talks about the way of the cross and predicts His passion, Peter rebukes Him (Mark 8:32). He has to remind them twice more, in Mark 9 and 10, and then again in chapters 13 and 14. Watchfulness is facing reality, not running away from it, or pretending something else is reality – like being the greatest, saving one’ s self, or gaining the whole world. Experiential avoidance is a psychological process that seeks to avoid what we believe will be painful feelings, thoughts, memories and bodily sensations within us. It causes us problems psychologically. For example, in times of conflict I would avoid facing the experience of my anger. I would end up with very tight neck and shoulder muscles that could go into spasm. But when I faced the anger and the cluster of thoughts, feelings and bodily sensations with it, the anger did not seem to be such a fearful power and authority as I thought it was. I have often tried to avoid anxious feelings by keeping busy. But as the Jesus Prayer helps us to slow down and still ourselves, we become aware of what we have been avoiding. How do we begin with the Jesus Prayer? It is important to pay attention to the body. Posture is important, and the way we sit. I find a prayer stool or a straight-backed chair where one can sit relaxed but in a good frame is important. Where we sit is also very important. Chose a place you can return to again and again that has no distractions. We can also pray the Jesus Prayer walking somewhere, or out in the world doing something else. Traditionally in the Jesus Prayer, the first half of the sentence is prayed on the in-breath – ‘Lord Jesus Christ, Son of God,’ – and the second half of the sentence is prayed on the out-breath, ‘have mercy on me, a sinner.’ The breath is neutral, it belongs to no particular religious group. Breathing is something we all do, and we take it with us wherever we go. That makes it a useful aid in our prayer life. When we are anxious we often over-breathe, and this rhythmic use of it in the Jesus Prayer slows our breathing down. I find that I repeat the prayer in cycles of 25, with a pause in between the cycles to offer prayers for whatever comes to mind, or simply to be in open awareness or contemplation of God’s presence. Beginning with four cycles is a good start. It takes time to learn to move out of the harbour and experiential avoidance into the open sea, in the coracle of the simple prayer. In Mark’s gospel we are made aware of our incompleteness and need to be open to God at all times. The Jesus Prayer brings us to that point as well. Mark’s gospel teaches us perseverance – what has been called ‘deep practice’. Those who master a craft are distinguished by how much time they spend in practice, not by their innate ability. A concert pianist will have done on average 10,000 hours of practice to arrive at that level of skill. The Jesus Prayer reminds us about the need for ‘deep practice’. However, God in His grace may give us moments of epiphany that keep us praying in this way. I have collected many books on The Jesus Prayer over the last few years, and will post some details in future articles. May it lead you into healing and the presence of God as it did for me. If you use the Jesus Prayer I would love to hear from you and start a dialogue, or if you are interested in using it.